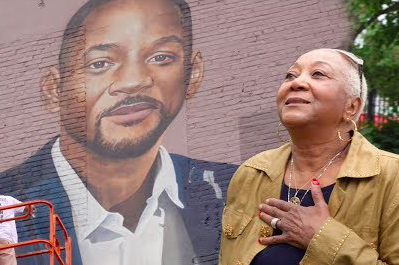 Will Smith's mother is awed by Richard Wilson's new mural of her son in West Philadelphia. The homegrown movie star now appears on the wall of Gevurtz Furniture at 4545 W. Girard Ave., posed in an allusion to Kehinde Wiley's presidential portrait of Barack Obama (a pair of Jordans and other casual attire were swapped in for the Fresh Prince). In coordinating the Smith mural, Wilson worked with Mural Arts Philadelphia and Global Leadership Academy Charter School to secure the site and offer community engagement on the project. Smith is expected to make a visit to Philadelphia in the coming months. In the meantime, he took to his YouTube channel to talk about what the mural means to him, how his mother feels about it and how it fits into the community he grew up calling home. Smith decided to create merchandise around Wilson's mural in order to raise money for Global Leadership Academy Charter School. All proceeds from purchases will be donated to the school.